As owners of a café and catering business on Hilton Head for 20 years, we had realized something was wrong. Chef Christine’s health just wasn’t up to the workload anymore. Once we finally learned the problem was Parkinson’s, our next step was to design a life to keep her happy, healthy, and stress-free. The natural place to begin our wellness journey was our favorite getaway, Costa Rica. The Southern Zone is an agricultural area, and we had heard about a farmers’ market in Tinamastes, a small village below San Isidro del General. One visit convinced us that we had found our new home. We met Tico farmers selling their freshly picked, organic produce, shamans and holistic healers, tattooed Millennials from many countries selling jewelry, handmade musical instruments, essential oils and various homeopathic tinctures, and happy expats. Everyone was talking loudly and laughing together, shopping and swapping the weekly news. It only took us another year to sell off or give away what wasn’t necessary and move to Costa Rica, with seven suitcases and two shipped pallets. Now, Tuesday morning with our friends at the Vida Autentica market is our favorite time of the week. In a year, Christine’s symptoms have benefitted dramatically from eating fresh organic food, breathing clean mountain air, and living among the kind and generous Ticos. Acupuncture, Chinese medicine, and yoga are all part of our weekly regime, and both of us are feeling revitalized. 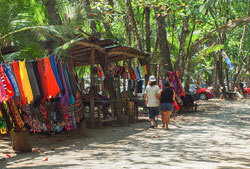 Villages in Costa Rica’s Southern Zone have regular markets selling organic produce and handmade crafts. Our Spanish lessons have progressed to the point where we can get into trouble much quicker, as the Ticos now assume we can actually speak their language, and answer our stumbling questions with a barrage of rapid Spanish. We are slowly assimilating into the local culture, which has been a goal since we arrived. Why Costa Rica? Stability. No standing army since 1948 reflects the attitude of peace here. 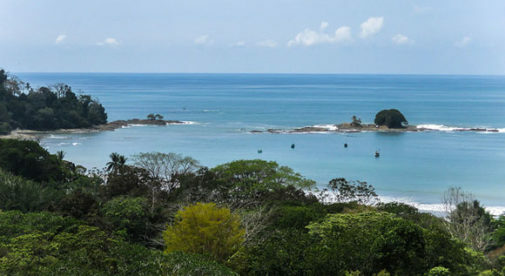 We chose to stay flexible by renting a mountain home above Dominical, paying $1,000 a month for a house on 75 acres with three bedrooms, two bathrooms, a pool, and a wide view of the Pacific beyond the mountains below. Electricity, water, and internet are another $150 or so. Imported products are available here if you need to live as if you were still in your home country, but they are expensive. If you can live like a Tico costs are easily manageable. First-class private healthcare is always available, at very reasonable prices. If you are near the city, public transportation is everywhere, and the buses are modern, clean, and a great place to practice your Spanish. These days, we sit on our deck and enjoy the toucans and other exotic creatures which inhabit the jungle valley below us. We are reinventing our recipes using Costa Rican ingredients, and trying out theirs. I play guitar with other musical refugees from the 60s and scribble in my blog. Considering a new home? Come down, spend a few weeks marveling at the wonders of Costa Rica and see if they speak to you.